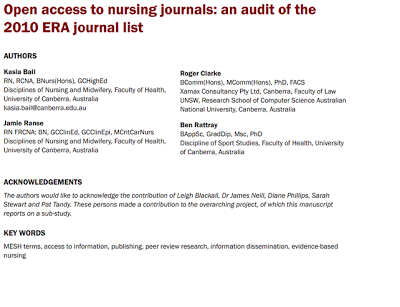 Objective: To determine the proportion of nursing journals that are fully open access or have some elements of openness, and hence are readily accessible by nurses in clinical settings. Design: A descriptive study, with interpretive analysis of existing data sources. Setting Access to online journals from the perspective of a nurse as a consumer. 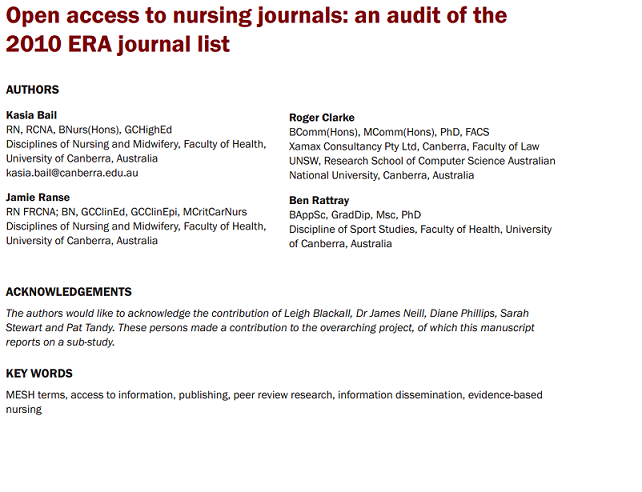 Subjects: Nursing specific journals from the 2010 Excellence in Research for Australia (ERA) list of publications. Main outcome measure The proportion of nursing journals with unrestricted online open access as of October 2011. Results: Of the 224 journals included in this research, 12% (27/224) had unrestricted open access to all published manuscripts, 39% (88/224) had partial or conditional access and 49% (109/224) had no elements of open access, and required the consumer to have access to a paid subscription. Conclusion: Approximately half (51%) of nursing journals surveyed have all or some articles that are open access. This is higher than other studies of open access research articles globally. However, barriers at an institutional level may need to be addressed to ensure nurses can be informed in their care of patients.